We arrived back in the UK from our glorious holiday in the desert to rain and gloom. I had arranged our flights so that we would come home on Friday mid-day and have a few days to recover before the working week began. Although a brilliant plan, it seems to have had no effect on our recovery. We were hit over the heads with a whopping case of jet lag. To make matters worse, this week I was hosting two international conferences at work, which meant six consecutive long days of being “on” and dealing with near catastrophes from morning till night. (No matter how well organized you are, something will go wrong; it is the nature of conference organization.) I learned an important lesson this week: never schedule a two week holiday directly preceding a conference that you are responsible for organising. Do you imagine that the combination of long hours, stress, and jet lag means no knitting? Think again, oh ye of little faith. The horrible weather we had all week, with downpours and wind, cold, hail and other nastiness, resulted in terrible traffic. Every morning we were stuck in traffic battling the elements and drivers who seemingly forgot how to drive in the rain. And there we were, Doug behind the wheel and me merrily knitting away. I managed to get quite a bit of the body of Leah’s sweater knit this week. Today, during a five minute break in the rain, Emma rushed Leah outside to get some photographic evidence. As you can see, this pullover is coming along nicely and the fit is fabulous. 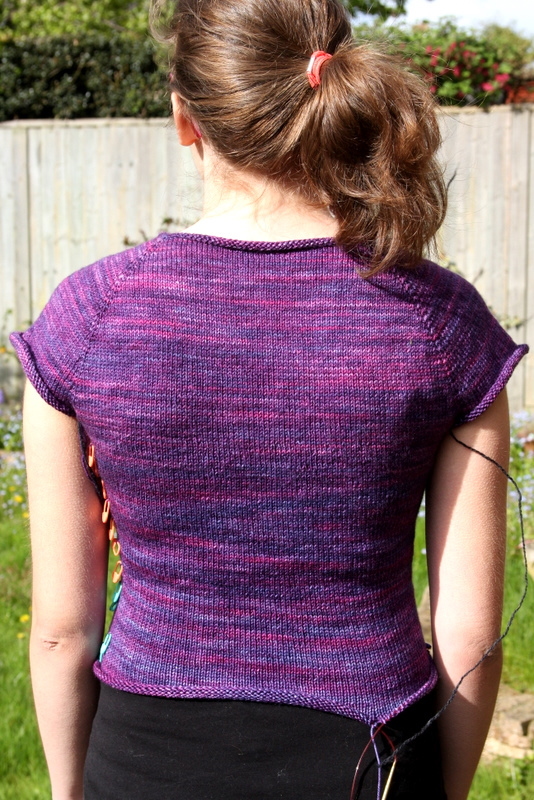 Though I am nominally following Wendy Bernard’s pattern for the Backwards Cabled Pullover, I am, in fact, winging it. I turned the sweater back-to-front, got rid of the short row shaping, and moved the cable (to keep it on the front beneath the deep square neck); all of these are modifications which Wendy suggests herself as options. I found however, that a few inches into the sweater, that I was better off just following my instincts. I changed the raglan sleeve increases. According to the pattern, they are made every second row, but it was clear that if I continued increasing at that rate, I would reach the required width long before I had enough depth for the arms; so after a few inches, I switched to increasing every fourth row. It doesn’t look as neat as it would have without the change, but it doesn’t look bad and it fits properly. 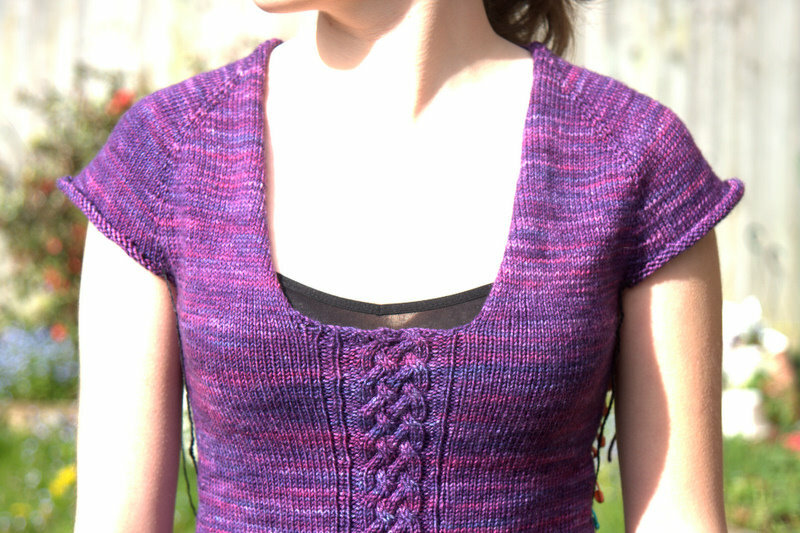 I find I have to do this anytime I knit a top down raglan because my row gauge is always tighter than called for by the pattern. 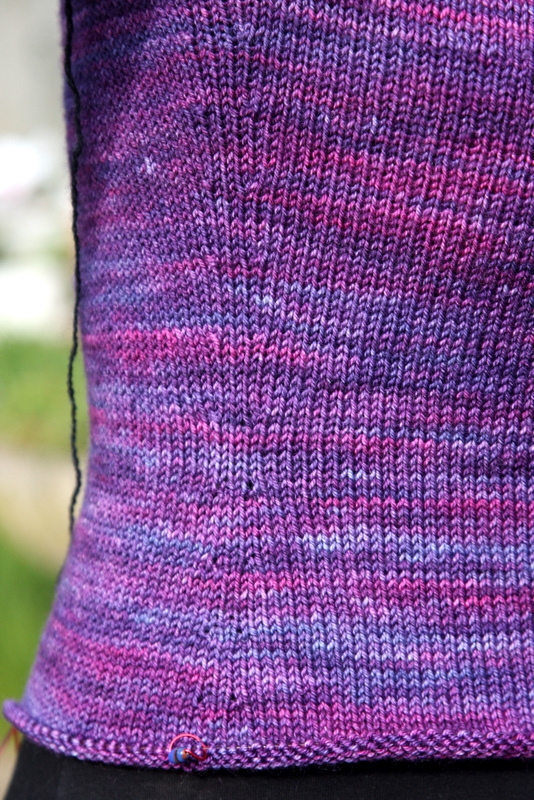 I also completely ignored the decreases and increases written in the pattern and made my own. Remember knitters, that patterns, like recipes, are guidelines; they are made to be tweaked. 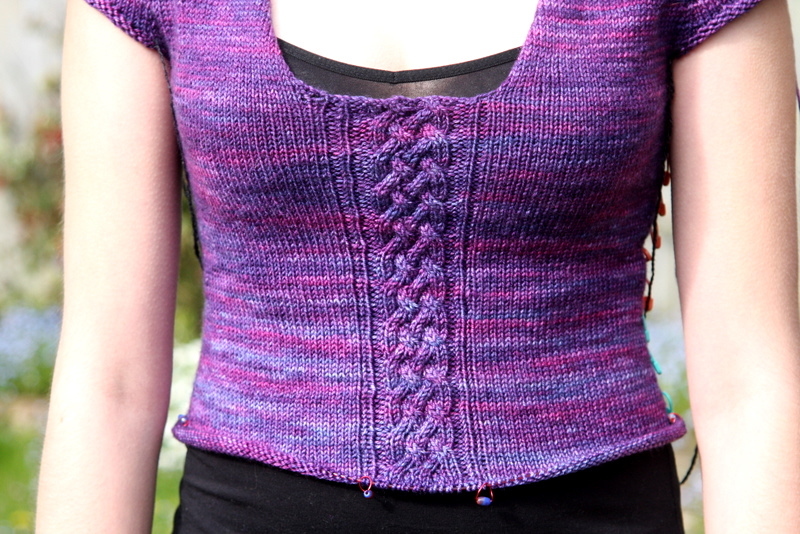 The pattern calls for four sets of waist decreases every 7 rows. The cable pattern (which is really lovely by the way) has an 8 row repeat. It seemed overly complicated to superimpose a 7 row repeat on an 8 row repeat; that would mean keeping track of every row. I would have to count! So, I made my decreases on the first row of every cable repeat; thus every 8th row. I marked the beginning of every cable repeat with a pink removeable stitch marker, thus keeping track of the cables and the decreases simultaneously. I kept decreasing every 8 rows until the sweater looked right on Leah. This means trying it on frequently, which can be annoying, but it results in a good fit. I did a total of 7 paired decreases instead of the 4 the pattern calls for (we are after slinky here), and then at the next pattern repeat I started paired increases for the hips. I marked each of the increase rows (which correspond to the cable pattern repeats) with a green removeable stitch marker. This means that I never have to count, or keep track of anything. The sweater just knits itself. Hooray! 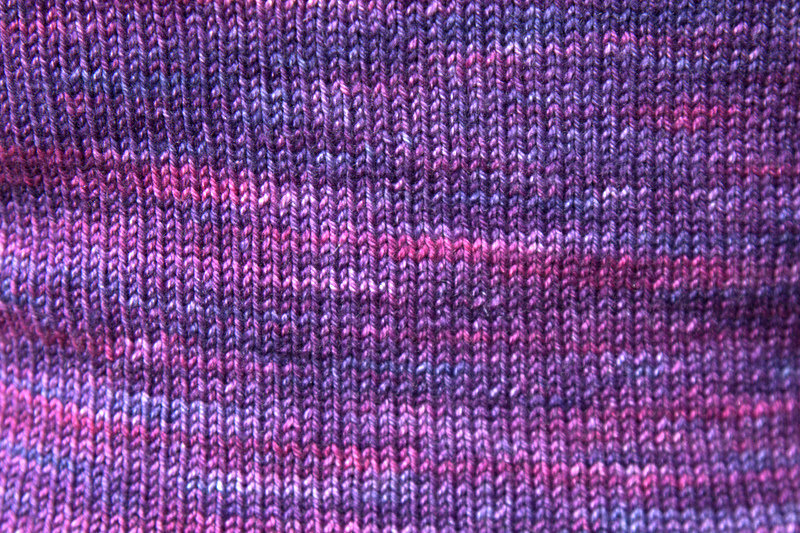 This entry was posted in Main and tagged Flash of Purple, Knitting, Madelinetosh Pashmina, Wendy Bernard by knitigatingcircumstances. Bookmark the permalink.